We have had a good stretch of what we call cold here in Houston. Lows in the mid 30’s F. The bees are staying warm in the hive and only venture out when the sun warms the hive. The damn weeds don’t seem mind the weather and even if I don’t want to, I know I have to keep the attack up! Mornings are spent enjoying my coffee, watching the flames in the fireplace and experimenting with sourdough bread making. Today, at least from appearance sake, I have a success. Some of my less aesthetic looking loaves have tasted great! The sourdough aroma is awesome! I use my bread machine for the heavy lifting. It seems to work well most of the time. The only variable is the dough consistency. I am learning to better gauge the liquids needed. The base recipe is close to the right volumes but if it errs, it is a bit dry! I have learned to resist the temptation of adding too much. I have learned to add just teaspoons of water and do it slowly! Put machine on dough cycle. When complete dump out onto a greased smooth surface and stretch it out. 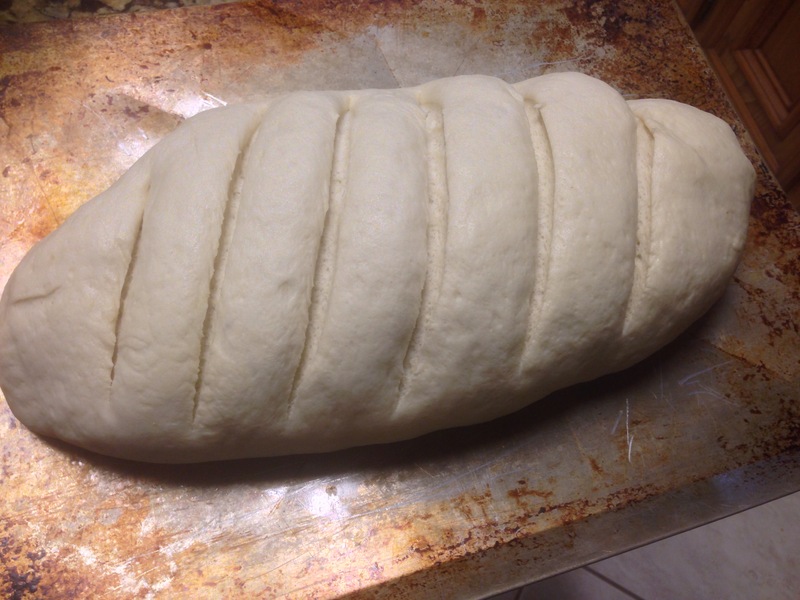 I watched a few videos on how to fold and shape the dough – that is up to you. 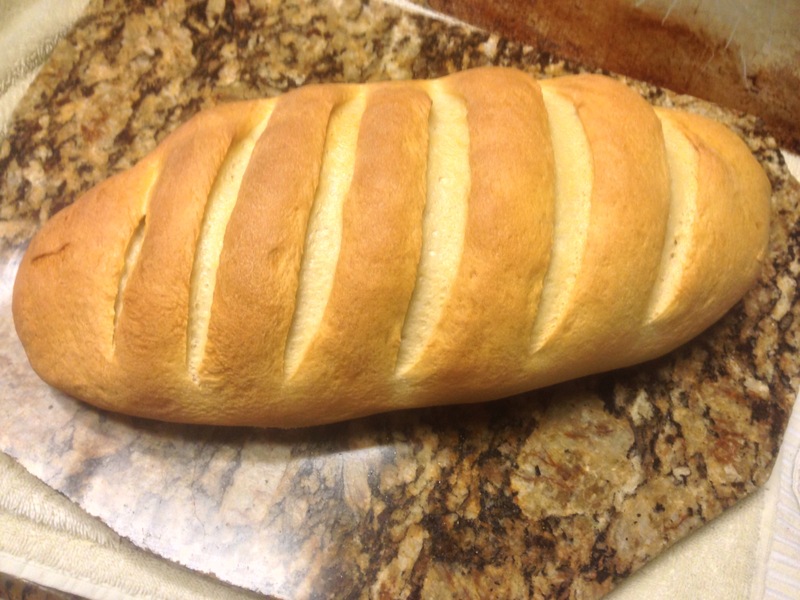 I made a nice elongated loaf. Let rise for an hour or so, score the loaf and bake 35 minutes or more at 400 degrees F until done. Thump it and if it sounds hollow you are there. I also put a pan of water in the oven for steam. The garden still calls to me! Lots and lots of strawberry blossoms and berries are developing. The 100 new strawberry plants are looking great, sending out new leaves and looking very healthy. Carrots are fattening up, beets are building roots and the snap peas are blossoming! Bish – sour dough bread, how interesting. While I know it is a truth, sometimes I forget that much of life requires skills, patience and allows some creativity and flexibility to achieve a desired destination. So your bread making play by play reminds me. I am amazed at your diverse skill set ..but more amazing is your creative sharing of your hobbies. Keep sharing …thanks! Thanks Chuck….My wife says that I will never truly retire…she says that doing nothing is not in my nature! What a good idea to use the bread machine to knead the bread and then bake conventionally. I never thought of that. We’re experiencing quite a cold snap here in Southern California, too. I live less than five miles from the Rose Parade route and the temps are expected to drop as low as 30 degrees tonight. It hasn’t been that cold on the 31st since 1952. That is cold for us! Wishing you a very happy new year and I look forward to more time in your beautiful garden! Thank you and have a great time when you do visit the Central California Coast….one of my favorite places. I saw news reports of the wind and weather,,,,out of character for Southern CA. nothing better on a cold day than warm, homemade bread!